Rosalie "Timmy" Lee, 89, of Vermillion, Kan., died December 5, 2018 at Blue Valley Senior Living in Blue Rapids, Kan.
Visitation is Saturday, December 8, from noon until 2 p.m. at the Vermillion Christian Church. A funeral service will begin at 2:00 p.m. at the church. Virgil Warren will officiate. The pallbearers will be Jimmy Cornelison, Ron Cornelison, Josh Lee, Robert Lee, Michael Lee and John Lee. The honorary pallbearers will be Rhonda Tremble, Hallie Beardsley, Tammi Budenbender, Amanda Valburg and Jessica Reilly. Burial will follow in the Vermillion Cemetery. Timmy was born October 31, 1929 at Beagle, Kan., to Charles Martin and Addie Marie (Chambers) Kuder. 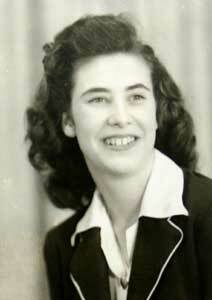 On May 25, 1947, she graduated from Osawatomie High School. With the help of a friend she met a young Robert F. Lee from Vermillion in 1947. While she was working at a grocery store, he made an excuse to buy a gallon of apricots (which he disliked) to meet her. After a short courtship they were married on May 26, 1947 in Paola, Kan. The next day they were south of Vermillion to help his father plant the corn crop. For a short time later, they lived near Kansas City before returning to Vermillion to make their home. Timmy worked at Hal’s High-Class Grocery, purchased the Vermillion Sundries in 1970 and operated Lee’s Café for 45 years. She worked until the age of 86. She enjoyed watching her children and grandchildren’s sporting activities, watching sports on T.V., critiquing the coaches, sports officials, playing cards and going to the casino. She was a member of Red Hatter, Vermillion Community Club, Vermillion Christian Church, served as Mayor of Vermillion and helped coach girls’ softball. She was preceded in death by her parents; husband, Robert on May 29, 2010; and two sisters, Nonie Niemeyer and Marguerite Niemeyer; and four brothers, Jerry Kuder, Ed Kuder, Bill Kuder and Mike Kuder. Survivors include two sons, Ron (Vicki) Lee, Blue Rapids, Kan., and Robert (Savina) Lee, Gladstone, Mo. ; two daughters, Janet (Jim) Cornelison, Vermillion, and Joy (Steve) Ensley, Blue Rapids; brother, Jim Kuder, Independence, Mo. ; sister-in-law, Mary Alice Kuder; 11 grandchildren and 22 great-grandchildren. A memorial fund has been established to the Vermillion community and will be designated later. Contributions may be sent in care of Padden Funeral Chapel.